Forestry Consultant: Snowshoe Hare Forestry Services, LLC. Assist with: Timber sale set-up & administration, Timber appraisals, GIS mapping, Tree planting assistance, and Management plans. Curt Hare Jr. Phone: 715-891-4402. Address: 2698 Columbus Rd., Eagle River, WI 54521. Email: curt.hare@gmail.com PIF members receive a 10% discount. Title and Broker Services: For service when buying, selling, transferring to heirs or financing your woodland contract: Roy D'Antonio, Owner-President, Associated Title & Closing Services Agency Inc. and Guardian Title Services Inc., Address: 205 Harrison St., Ironwood, Michigan 49938. Phone: 906-932-6340 Email: roy@assoctitle.net. Also Associate Broker, Eliason Realty of the North, Land O' lakes, WI., Phone: 715-367-1718 Email: roy-dantonio@hotmail.com A long time woodland owner serving you! The Living Forest Cooperative based in Ashland, WI, is a cooperative where the costs of management, processing, and marketing are shared through the cooperative business. By collectively marketing, members command higher prices for raw and processed wood products. A single small landowner is at a disadvantage in the timber market. Few people have the experience, time, or money to sustainably manage a forest and process and market wood products for maximum return. The Cooperative pools member harvests and explores opportunities for production of value added wood products. 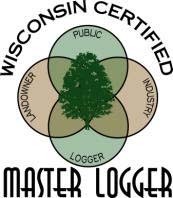 Certified Master Loggers live and work throughout Michigan and Wisconsin and they understand the multiple values woodlands provide. Above all, they understand that conducting forest management practices, though intimidating, can be one of the most rewarding experiences of owning forestland if it is done correctly. If you are looking to hire a Michigan or Wisconsin Master Logger or are curious what benefits could come from hiring one, we encourage you to contact us. For more information on the program’s requirements and for a full list of Master Loggers, please visit the respective program websites at: www.wimlc.com or www.mimlc.com or contact us at: sri_dpeterson@sbcglobal.net or 877-284-3882.